Whether we want to grow food or enjoy beautiful flowers, pollinators are so important to our gardens that an entire week has been dedicated to them. About 75 percent of all flowering plants rely on animal pollinators, according to Pollinator Partnership, which works to protect the health of these animals that are vital to not only our gardens, but to agriculture and our ecosystem. The group initiated Pollinator Week, held this year from June 15-21, out of growing concern for pollinators. There are many animals that pollinate our crops and plants, but gardeners probably think first of bees, in part because Colony Collapse Disorder has been killing honey bees since 2006. The cause as well as the cure of Colony Collapse Disorder have remained complex and elusive. In addition, high overwintering losses in recent years may be due to still other problems facing bees, according to the Pollinator Partnership. These include parasites, bacterial diseases, pesticides, nutrition, genetics, queen quality and management. One thing home gardeners can do is to avoid the use of pesticides. Pesticides may kill the pests you want to get rid of, but they can kill pollinators, too. If you have to use pesticides, use them carefully. Another thing you can do is to plant things that attract pollinators. The Pollinator Partnership has guides to help you choose plants for your area; different parts of Western New York are in different ecoregions and have different guides. Find your guide by typing in your Zip Code. You can also download an app for your phone called the Bee Smart Pollinator Gardener. It allows you to browse through a database of nearly 1,000 native plants. Filter your plants by what pollinators you want to attract, light and soil requirements, bloom color and plant type. See more great information from the Pollinator Partnership on making your garden hospitable to pollinators, and make your lawn pollinator-friendly, too. See herbs from Mike Weber Greenhouses that can attract pollinators. The Buffalo and Erie County Botanical Gardens will hold a Pollinator Festival from 10 a.m. to 3 p.m. Sunday, June 14 at the Botanical Gardens, 2655 South Park Ave., Buffalo. The festival is included with admission to the Botanical Gardens, which is $9 for adults, $8 for seniors (ages 55 and older) and students (ages 13 and older with ID), $5 for children ages 3-12 and free for Botanical Gardens members and children 2 and under. On this day only you’ll be able to walk through an enclosure with real butterflies. The enclosure will be set up with help from the Eastern Monarch Butterfly Farm in Clarence. Get there early– Sally Cunningham, gardening expert, will speak on plants for pollinators at 10 a.m.
More speakers will be scheduled in the afternoon. David Clark, the nationally known gardening educator who teaches the horticulture classes at the Botanical Gardens, will speak on beneficial insects and other pollinators, with an emphasis on mason bees. Dave O’Donnell of the Eastern Monarch Butterfly Farm will speak. Visitors will receive a detailed schedule when they arrive. Vendors will sell native plants and honey products. If you miss the festival, you can see a pollinator exhibit through Aug. 2 at the Botanical Gardens, but you won’t be able to walk through the butterfly enclosure. The Great Sunflower Project aims to map pollinators across the United States and Canada and needs volunteers to help. The project gets its name from the Lemon Queen sunflower, but you can count pollinators on any plant, even if you can’t identify the plant species. You can count pollinators in your own garden or while you’re out on a walk. The Sunflower Project gives you easy-to-understand directions on how to do the counting. Get all the details here. 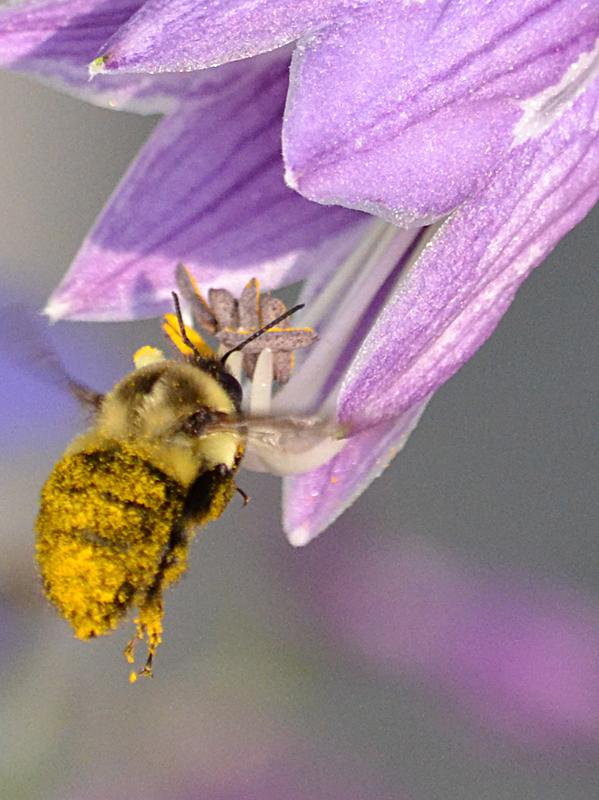 The project and its thousands of volunteer observers have been gathering information on pollinator service since 2008, and now have the largest single body of information about bee pollinator service in North America.